I’m oddly comforted by the photo of Jonathan Lethem that adorns the rear flap of his latest short story collection, Lucky Alan. Gone is the ultra-hip young author who stared almost defiantly at me from the flap of The Fortress of Solitude. Could I ever be as sharp as that guy? As astute? As literary? As Brooklyn cool? Nor could I compete with his latter incarnations—the bespectacled and bemused working man in plaid of Chronic City, for example, or the grinning, self-assured Cheshire cat of The Ecstasy of Influence. 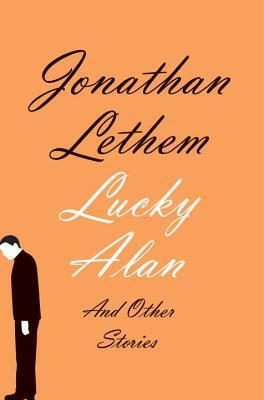 But the latest incarnation of Lethem is right up my alley. He’s going gray. He’s looking away from the camera with a countenance of mild concern. His baseball cap is barely broken in. His double chin is on display for all the world to see, and I couldn’t be happier. What Lethem’s latest author photo signals, at least to my eyes, is that he’s reached a point in his career where he isn’t worried about appearances. In terms of the distinction between “White Elephant Art” and “Termite Art” that he borrows from the late painter and writer Manny Farber in The Ecstasy of Influence, the image suggests that he’s emerging from the cocoon of his white elephant suit to fully embrace his termite self. To an extent, the stories collected in Lucky Alan bear this theory out—which itself is quite a feat considering the mainstream publications in which the majority of them first appeared. Yes, as one might expect from The New Yorker fiction, a good chunk of these stories focus on the quirky obsessions of oddball characters with idiosyncratic names. And, yes, the climaxes in these stories tend to involve epiphanies that reinforce, justify—or at least rationalize—the quirky obsessions of the oddball characters in one way or another. In this instance, it’s almost impossible not to fall in love with both the young Espeseth and Lethem’s skill at capturing the preteen imagination. Who among us – at least those of us who grew up in an age before smartphones, iPads, and backseat video screens – didn’t invent such games to pass the time? And what bizarre ethical predilections did these games reveal about us? By giving us this unguarded but not entirely innocent moment from Espeseth’s childhood, Lethem gives us a window into our own souls and challenges us to trace the origins of our quirky predispositions. In addition to burrowing deep into his characters’ histories and psyches, Lethem also embodies the termite mystique in this collection by continuing to take risks with form. Most notably, “Their Back Pages” reads like an amalgam of comic book scripts, journal entries, and free-form poems as it recounts the efforts of several B-list characters to survive on a deserted island, and “The Dreaming Jaw, The Salivating Ear” needs to be read backward (more or less) in order to make narrative sense. Of course, neither of these pieces appeared in The New Yorker, but their experimental nature makes one wonder where Lethem would be as a writer had he stuck solely to the termite’s path throughout his career. The answer, of course, is that nobody would care because hardly anybody would have heard of him. But now that he’s established a name for himself, he can afford to experiment, can afford to dig deep, can afford to show off his gray hair and double chin. To put it bluntly, he can just have fun with writing and not worry about what the world thinks—which is a good thing for the rest of us. As we all grow older together, it’s nice to know that some of us are still capable of eager, industrious, unkempt activity. Marc Schuster is the author of The Grievers (Permanent Press, 2012) and The Singular Exploits of Wonder Mom and Party Girl (Permanent Press, 2011). He teaches writing and American Literature at Montgomery County Community College in Blue Bell, Pennsylvania. Find him on the web at http://www.marcschuster.com, and on Twitter at @marc_schuster.